Waikato rockers Medusa Glare return to the stage after a 3 year hiatus. Playing all your older favourites, plus some brand new songs performed live for the very first time. 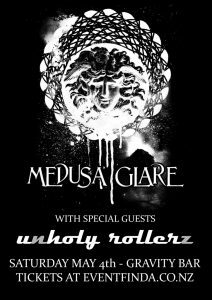 Sharing the bill are good time feeling local rockers Unholy Rollerz.